In the mythical, mystical world of Thomas Adès' Tempest, there are rich aural experiences associated with the island and its denizens: wild storms and eerie calm; smooth, politic betrayal and innocence so profound as to be unwittingly cruel. Allusive orchestrations are given unexpected twists. In the overture--a tempest that drew on the storms of operatic history while possessing a distinctive texture--there were echoes of late romanticism in the brass, and perhaps inevitable reminiscences of the sea interludes from Peter Grimes. The orchestra is also used creatively to evoke different characters and their emotional states (sometimes in ways that seem at odds with the doggerel libretto.) Caliban, on the rare occasions when he isn't in coercive situations, has some of the most beautiful music in the opera. Ariel gets unearthly winds, Ferdinand and Miranda gracefully intertwining lines, the courtiers of Milan and Naples more formal exchanges structured around declamation. These rich dynamics (which cannot be easy to create with both precision and impulsive energy) were richly realized by the Met orchestra under the baton of the composer. Despite all this excitement, the dramatic pacing of the opera seemed uneven to me. After the stormy beginnings, the action seemed somewhat becalmed until the second act. My perception of this, however, may have been adversely affected by the production, which had Miranda and Prospero sitting alone on a slightly raked stage for most of Act I, where others came to join them. The prompter's box, of course, belongs to Prospero. 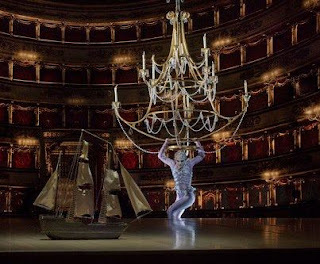 Robert Lepage's production (located often inside a model of La Scala as it was in the eighteenth century) was not infrequently thoughtful, but it was not coherently so. 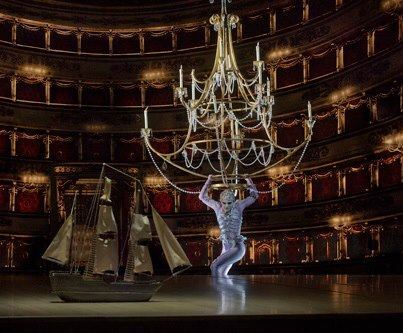 Many of its most interesting ideas appeared in the final tableau, where I saw for the first time serious engagement with the reasons for presenting the drama inside an opera house. The chorus exults in their pardon: do we go to the opera to get our sins forgiven? Do we need to go through the harrowing of hell to receive this absolution? Ferdinand and Miranda are radiant and radiantly illuminated on the stage. Is this what we want to be promised--the future of the young lovers--at any cost, and no matter how artificially engineered? Here (at last) it became fully apparent that Prospero's theater is a trap to him as well as to those he manipulates with and in it. For the most part, however, I couldn't see that Lepage was doing much beyond spatially confusing the narrative. If layering of narratives was going on, I couldn't make it out: however artificial the tableaux he stages, Prospero's dilemma, and his corrosive anger, are stunningly real. Some of the incoherencies must be attributed to the plot as well as the production. Why is the full court of Naples (and Milan) under sail? And why does Prospero drown them only to resuscitate them? The further question raised by Lepage's production--what does this say about the reanimation of the dead by theatrical art--was left hanging. Caliban also fared badly; the production clad and choreographed him as a simian savage, and the rest of the island inhabitants fared not much better. (I literally cringed during some of the dance sequences; postcolonialism takes harder work than casual appropriation of stereotypes.) The libretto, too, though significantly altered from the Shakespearean plot (and replacing his verse with halting rhymes) has Caliban as lustful, treacherous, gullible, and prey to base desires. Those who denigrate him can of course be viewed as unreliable and manipulative narrators, but this doesn't fully solve the problem. The sea-change the drama undergoes at the hands of Adès and librettist Meredith Oakes creates scenarios rich and strange indeed. Scarcely any of the characters is left unaltered. Stephano (Kevin Burdette) and Trinculo (the fantastic Iestyn Davies) retain a comic function, but their greed for the riches of the island is made sinister indeed by Adès' music. I was delighted by Davies' clear and expressive singing, which was paired with excellent comic timing. The courtiers of Naples and Milan were also well-cast. John Del Carlo was a solid if slightly dry Gonzalo; he is clearly the most idealistic of the group, speaking of liberty and providence. William Burden, as the grief-stricken King of Naples, was indeed so compelling that I had forgiven his past scheming long before his public confession of remorse. Prospero's brother Antonio (beautifully sung by Toby Spence) was another story entirely: grimly determined in his suave manipulation of a corrupt and manipulative system. Alan Oke's Caliban seemed vocally typecast, but he handled his difficult music with assurance. Perhaps least changed is the ardent Ferdinand, sweet-natured and sweetly sung by Alek Shrader in his Met debut (a suspicion of strain at the top of his range made me wonder whether the house might not be a shade too large for his voice; but it is a beautiful voice.) Isabel Leonard, as Miranda, proved herself once again to be a stylish singer and a gifted actress. She sang fluidly, varying her vocal color impressively. Miranda's qualities of the play are not so much changed as magnified: she has the natural egoism of youth and the unnaturally complete innocence which her father has taken such pains to preserve. Leonard's Miranda is intelligent enough to resent this, and she does not empathize with her father as much as she does with Ferdinand; knowing nothing of the world, she does not comprehend her father's sorrow. Adès' vision of the blithe spirit Ariel is a hauntingly uncanny one, requiring astonishing vocal acrobatics. Audrey Luna executed these, in addition to the physical acrobatics required by Lepage's production with considerable panache. The eerie otherness of Ariel's music makes his interactions with Prospero unusually interesting. The ambiguous and charismatic figure of Prospero is, in Adès' opera, chiefly characterized by dangerously corrosive anger. This is, however, not without an admixture of remorse, and his tenderness towards Miranda, however misguided, is genuine. 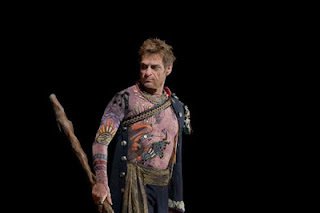 Simon Keenlyside realized all this, bringing Prospero to vivid life as a man deeply, even tragically flawed, and letting us see his gradual realization of his own crimes (sins, to use an unfashionable word) and his relinquishing of them. His singing was muscular, confident, nuanced, and his English always intelligible (the exception rather than the rule of the evening.) Occasionally through Prospero's bitterness we can see his surviving love of beauty; through his anger at his daughter's disobedience, his fear for her. And over the course of the evening we see his growth, until the stunning third-act soliloquy where he accuses himself of bringing the torments of hell to the previously innocent island. He vows to drown his books, to break his staff; even Miranda he relinquishes. Once he has restored order to the society of the court, it loses interest in him. He begs the emancipated Ariel to stay; but love has played no part in their bond, and the spirit flies away, released. Prospero's despair has never felt so real (and yes, I cried.) But the story is, after all, not fully his: as the ship sails away, Caliban is left alone again to enter into his heritage. As Ariel's voice soars aloft, the sounds of the island gradually return to peace.